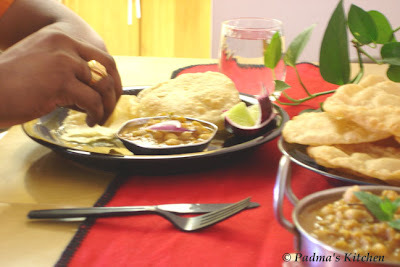 When Anita of "A Mad Tea Party" announced the celebration of Indian Independence Day week with Poori and bhaji, I was already exhausted making them last weekend and top of that I did not capture them on my camera, pity! touring NY/NJ was already taking toll on me. I had to make my presence in this event as I forgot to email for JFI-Chillies to Nandita. So made sure that we had poori's today for brunch this way I won't miss to post on this event. Its party time at Mad Tea Party, so please gals dress up and see you all there. We generally make potato/aloo curry to go with it, but pooris are so friendly and can be accompanied by variety of side dishes like shrikhand, amras, pickle, kesar halwa and many more. Pooris are cooked almost in all states across India. Since last week only I had pooris with aloo/potato curry, I made Chole (chickpeas/Garbanzo beans curry) this time. You can see in the last photo my DH is enjoying a *Nivala* (bite). In a large vessel mix wheat flour, salt first and then add sour cream and little water knead into a soft dough. Cover and leave it for ½ hour. Make this into smooth round even sized balls. Using a roller pin flatten the balls one by one to make it round and flat of medium thickness. Deep fry this in oil till the poori pops fully and then drain and remove it from the frying pan. Serve hot with Chole or any favorite side dish. Pressure cook the soaked chickpeas/garbanzo beans with little salt for about 5-6 whistles or you can use canned ones too. Meanwhile grate the onion and heat oil in a large sauce pan. To this add bay leaves, cinnamon stick and cloves saute till the aroma fills the room. Add the grated onion, chopped chillies, ginger paste, garlic paste and saute for 5 or more mins so that the raw taste of onion is gone. Then add all the powders and fry for a min or so, add crushed tomatoes/puree and salt. Lastly stir in the cooked chickpeas/garbanzo beans, saute till everything is mixed well. Hey Padma I love curried chickpeas! Your recipe sounds good love the pictures:) Please tell me what is chloe? Great combo Padma, loks very delicious to me!!! Pooris look great. With chole or channa as we call them, they are pure comfort food! puris are indeed very versatile. kesar halwa made my mouth water. 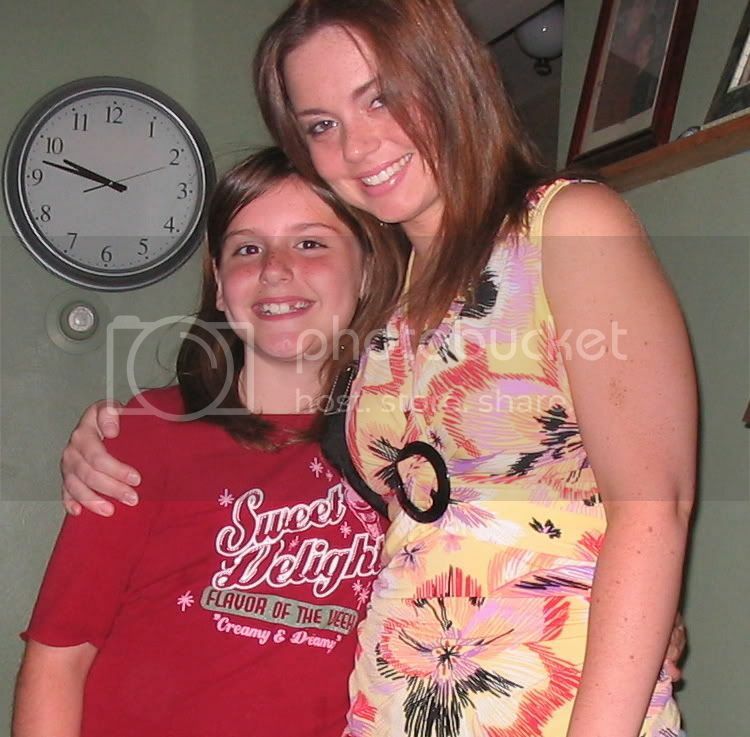 are u gonna blog that too? It's beginning to feel like a real party. Thanks, Padma, for joining in the celebrations with your family. The chhole look very delicious and your recipe is very close to mine. @ Jeena, *Chole* is another name for that Chana masala curry, am glad you liked it! @ Aruna, Saju, Anita, Srivalli thanks for your comforting comments..
Puri and chole ......hmmmm.My fav.Ur chole curry and puris r looking good. Thanks Ramya for stopping by, glad you liked it! Yours looks really appetizing, Padma. First time here. I hve sucessfully learnt to manoevre in the blogosphere. Everyone seems to be making pooris for some event! I too have announced an even. I invite you to take part. I did my schooling and degree in HYD. I am fond of andhra food. Nice to read some telugu words. Hi Padma...thanks for visiting my page :) I love garbanzo's so much...this looks and sounds so yummy, I'm adding this to my WAY too long list of bloggers recipes to try! Hey Padma, Lovely post. 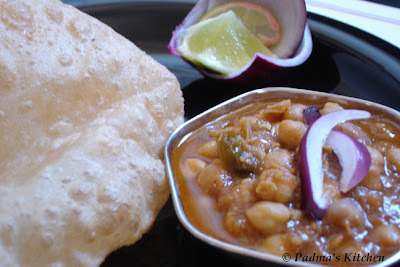 Its my favorite dish poori and chole I make very often and love it. It is the same way I make it taste very good. Cynthia, I will invite myself to your place when you cook pooris, that way we can share the fat/calories... hahaa hehehee! Athika, thanks dear and do pitch in you recipe for chole too! Who wouldn't love pooris?? usually I make potato masala or mixed vegetable kurma for it.. Chole is the one I make with chappathis..
Padma, how is chole masala powder different from garam masala powder? Does it have amchoor in it? Everything's so tempting. Someone's going to have to tie my hands behind my back to keep me from deep frying! I have to make pooris now. after seeing so many pooris and not able to eat them. too bad.